The brand gets its name from man's basic instinct - Survival. In a dog eat dog world, we need attributes that allow us to be ready to fight and claim what is rightfully ours. Hunt & Howe brings with its collection, the essence of this basic survival skill and bestows its wearers with confidence, style and pride. 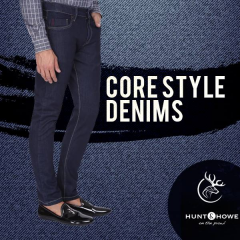 Explore the latest fashion collection of Organic Casual and formal wear for Men at Hunt and Howe. Newly launched branded Anti-Mosquito Cotton Menswear in India by Hunt and Howe.